We are an authorized reseller of Gemini Canada Limited manufactured dimensional lettering and related products. 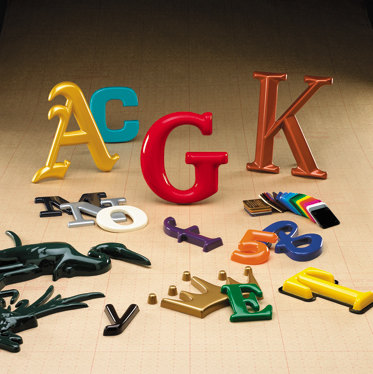 ‘Gemini letters’ are available in a variety of types, such as injection moulded plastic, formed plastic, flat-cut acrylic, flat-cut metal, and cast metal. They are used as raised lettering on dimensional signage, or are mounted directly on a wall to form the sign themselves. There are many options for style, colour, and texture, and custom shapes can also be created. These letters are precise and attractive, and offer a high-end permanent 3-D look to enhance your business identity.